[miau] International Game Technology, or IGT, has a large presence in the industry of slot machines. Cats is one of the most popular video slots ever made by IGT. Cats video slot is available on land, online and is even accessible on mobile devices. Similar in play to IGT’s ‘Noah’s Ark’ video slot, Cats also works on a structure with five reels, thirty pay lines and a massive jackpot. The game is uniquely designed, visually interesting and all around entertaining. Cats has colorful animations and fun sound effects including cat roars. Cats video slot has a standard game play but offers a stake option especially for the high rollers: players can bet more than one coin per pay line. 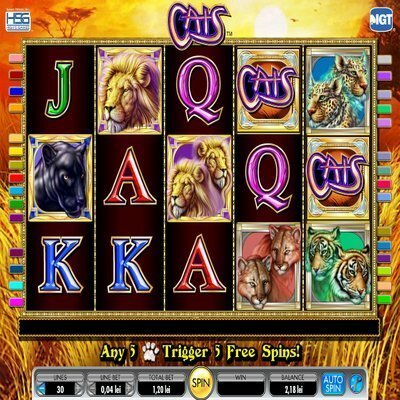 Most other games only allow one coin per pay line, making Cats special among IGT’s other games. Those not interested in playing with higher risks will be glad to know that Cats offers a high payout percentage. The return to player rate is 93.04% to 94.93%. Attached to the slot is a pay table available for viewing at any time. To view the pay table the player needs only to click on the corresponding pay table button. This video slot is designed to easily earn the player a modest sum of money while they enjoy themselves with the game. A free spin bonus round can be triggered if paw prints appear in the three middle reels, numerically the second, third and fourth reels. Five paws activates five free spins, but ten paws awards the player with ten free spins. Split symbols – double paw prints on the same icon – are worth double the value of the single paw print icon. One of the rarest qualities of IGT’s Cats video slot is that the bonus round is not the only way to win. The free spins are nice but not the only hinge to substantial payouts for the players. Most of the Cats symbols are cats: panthers (worth 2500 coins), lions (1000 coins), tigers (1000 coins), leopards (1000 coins), cheetahs (1000 coins), Ace (200 coins), King (100 coins), Queen (100 coins) and Jack (100 coins). The cat symbols all have additional split symbols; they can appear as one cat per icon or two cats per icon. Split symbols are worth double the value of single cat icons. Wins are calculated on the number of cat depictions present in the five reels, not just the number of symbols. The split symbols make it possible to end up with a 10-symbol win. The wild symbol is the Cats logo. The wild icon can be used as a substitute for any cat symbol. A 10,000 coin jackpot is awarded to anyone who lines up five wild symbols on any active pay line. A mid- to high volatile game, Cats can take you quickly from big wins to big losses and back again. The game seems designed for more experienced players. The risk is reasonable, however, with very large amounts of cash awarded to some players after just a couple of spins on this video slot. IGT’s Cats video slot is available online and on land in the United States of America, Europe and Asia. House edge is usually 5.07%.